This weekend I went hunting. As I was going for the largest bear on Earth and some amazing architecture, my “weapon” was the camera. Starting with the bear, that was easy to find (once you know where to look for it). No wonder, with a height of 23 ft (7 m) and weighting in at 370,000 lbs. (167,8 t) it can not easily be overlooked. 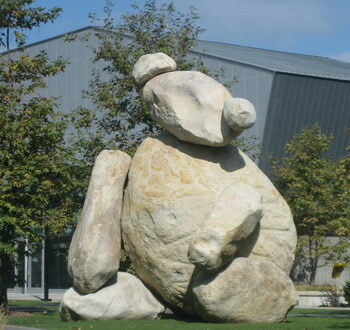 This sculpture, made from massive granite boulders, sits in the engineering courtyard at the UCSD Jacobs School of Engineering in La Jolla. The artist is Tim Hawkinson. The piece was commissioned by the university’s Stuart Collection and erected in 2005. Most interesting about this sculpture is the fact that seen from a slight distance the bear looks like a cuddly teddy bear. Just cute, sweet, like a toy left by a child on a lawn. Well, a rather largish child. But with every step closer this perception changes. The sheer mass of the piece becomes quite impressive. When one then walks away again and turns around, it is once again a sweet teddy bear. Any moment that child who left it there will come and pick it up. In my personal opinion – the bear is his best work. But that is just me and my personal taste. All of his pieces are certainly very interesting. Next PostNext Which Is Your Favorite Library?